On the day of the passing of Grigory Pomerants, together with a small group of colleagues, I spent an evening with Vladimir Bukovsky, one of the prominent representatives of the Soviet Union’s dissident movement. Our conversation with him this weekend followed his talk at Wolfson College here in Cambridge a few weeks ago, on January 25. One of the things that impressed me about that day was the genuine interest my generation expressed in his thoughts, opinions and recollections. He gave no actual lecture; he simply came prepared to discuss whatever we wanted to know. We tortured him with questions for about three hours, after which he finally stepped outside for a cigarette and ended up surrounded by young people again. When I headed off and turned to look back, he remained hidden in a noisy group of students. That made me happy, somehow — knowing that our dissidents manage to retain their relevance for the newer generations, especially given their relative conceptual non-existence back home nowadays. The many things Bukovsky did in his life include “И возвращается ветер…” [And the wind returns], a memoir that is one of those special books in my life. Its final words, along with a number of other quotations, can be found at the feet of Mikhail Shemiakin’s memorable monument to the victims of political repressions in Saint Petersburg. I still remember how struck I was to discover Bukovsky’s words at the gentle age of twenty. These sphinxes ended up playing a sizable role in my undergraduate senior project at Bard College in 2002. (One of them can be seen on the first image of this blog’s banner.) Located across the river from the notorious Kresty prison, they should be a site of pilgrimage for anyone visiting Petersburg and wanting to experience the city fully, not just touristically. Standing there on the banks of the Neva River in the wintry temperatures of about -20°C several years after Bard, I couldn’t copy the words with frozen hands, so I muttered them into my phone’s recorder through the snow instead. Surprisingly, I still have that recording. Несчастна страна, где простая честность воспринимается в лучшем случае как героизм, в худшем как психическое расстройство, ибо в такой стране земля не родит хлеба. Горе тому народу, в коем иссякло чувство достоинства, ибо дети его родятся уродами. И если не найдётся в той стране хоть бы и одного, чтобы взять на себя общий грех, никогда уже не вернётся ветер на круги своя. … Needless to say, a smaller and more intimate gathering with Vladimir Bukovsky was not something I could miss, so I gladly accepted the invitation. My friend and colleague on the Memory at War project, Tom Rowley, also came along. Tom, who hails from Birmingham, researches how dissidents are remembered in contemporary Russia and Ukraine. From the beginning, his topic hit close to home. Over the past years I’ve wondered about the curious parallels and contrasts between our perceptions of dissent, given that we grew up on opposite sides of the Iron Curtain. 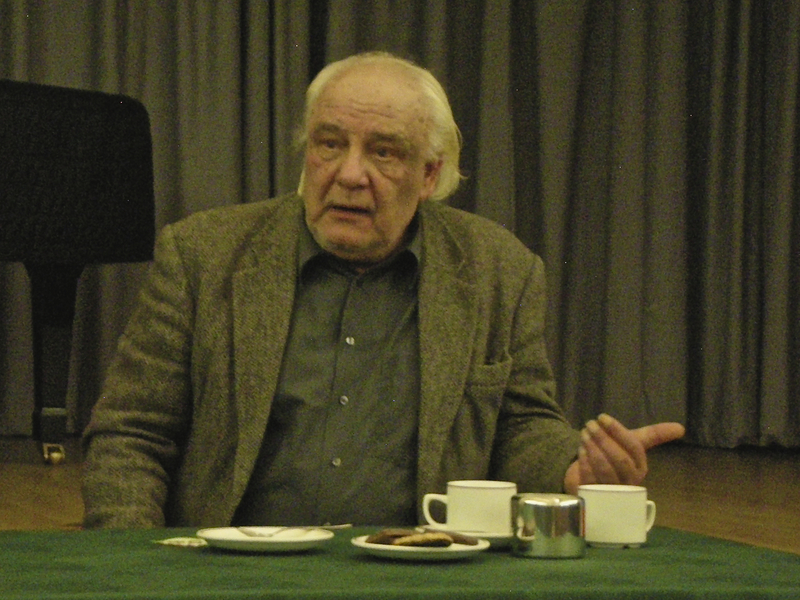 So we decided to combine our reflections on the time spent with Vladimir Konstantinovich; Tom’s entry Meeting Vladimir Bukovsky lives on his blog Cultural Memories of Soviet Dissent. “He [Bukovsky] talked eloquently about what was happening behind the scenes during perestroika and why the plans of that time have not turned out the way he hoped,” notes Tom in his entry. And, indeed, the plans of that time did not turn out the way he hoped. This was one of the most important topics discussed that night. It turns out that in the early 1990s, Bukovsky had succeeded in convincing almost everyone among the authorities to carry out and televise a sort of public trial over the CPSU (Communist Party of the Soviet Union). It is my understanding that he wasn’t asking for individual trials, just a trial of ideas — a type of acknowledgement and repentance of things that happened in the past. A closure of sorts. All but one person agreed to proceed. That one person was Boris Yeltsin. He was convinced, says Bukovsky, that the CPSU was down for good, and won’t be coming back, so it’d be best not to muddy the water. And then, months passed and the momentum died down. I hadn’t realised how close we’ve been to this type of public closure. I wondered, and perhaps will wonder for years to come, how things would have turned out if such a trial was televised at that time. Would it have carried the resonance of Khrushchev’s Secret Speech of 1956? Would it have allowed the country and its people (as well as the people in the neighbouring nations) to process the past and start anew, on some levels? Judging by the overwhelming public reaction to Tengiz Abuladze’s “Repentance” in 1984, many were in need of that sort of dotting-the-i’s. If this moment in time was missed, is it gone forever? And if not a single person in that country will take upon himself the shared sin of the many, never again shall the wind return onto its normal path. Responsibility, agency, repentance, closure. Otherwise — “никогда уже не вернётся ветер на круги своя.” I wonder if what we most need now is our own Roberto Miranda. Without really knowing you and while I have had a brief and intense interest in Vladimir Bukovsky (and without knowing this person, either) after reading “To Build A Castle” – some people have never been in a real castle, which is important to know – this is an excellent column about things that need be kept alive in the face of some Russians dependence upon their being put to sleep through the attrition of memory and intellect on this subject matter. I do not speak Russian, though while I have great interest in the obvious paradoxes and details about how Russia and its neighbors became communist and continue to harbor Marxist and other problematic ideas, it is obvious you should have a greater audience to shed more light on why and how it is important for everyone to know about how the soviets tried what they did, especially in the areas of historical views, science, commerce, internal policies, and so forth, that flew in the face of various freedoms and even common sense, That you have written this column on V. Bukovsky is highly important in the same way the soviets tried rendering him voiceless and a nullity, and in the process with him and others now retired or passed, engendered first the anger of popular acclaim as to what they did in practice, and then the further ostracism as to the immorality and illegality of the totality of beliefs behind their actions against him. I would cite the literature, but do not know it well enough myself, having been subject to … . While he might not be accepting of this, people like me know V. Bukovsky, and publicly in the face of his own views, should speak more about the soviets, as people like me know he has a gift in this without the obviously frustrated and impulsive gesticulating in these matters that is carried out by others. A great column here. It’s great to hear that students in Britain have a genuine interest in Mr. Bukovsky’s story and in what he has to say. I think “To Build a Castle” will be an important testimony for future generations in the West, too. I find your post on Vladimir Bukovsky’s 73th birthday… may he enjoy many happy returns and more or less forget about the serious health problems he had to face this year. I was utterly disgusted to hear about the recent legal attacks against him in the UK. I wonder what their motivation and origin are… But Mr. Bukovsky’s free spirit is undiminished and there is little doubt he will defeat them! Will they be able to tell their own children and grandchildren how in their peaceful sky, right above their heads, one could still behold the majestic fading flashes of history; this history was distant and inaccessible and had a bloodred hue – like tulips, like blood, like coca-cola.